In most countries surveyed, majorities consider religion an essential part of their lives. However, younger people are generally less likely to say religion is very important to them. This is especially true in Western Europe, where relatively few young people say religion plays a key role in their lives, but the same pattern can be found in other countries around the world as well, including the United States. In addition to an age gap, there is also a significant gender gap in most nations over religion’s importance. Women are consistently more likely than men to describe religion as very important to them. The largest gender gap on the survey appears in the U.S., where 65% of women consider religion very important, compared with just 44% of men. Muslim respondents consistently rate religion an important part of their lives, and traditional Islamic practices – such as praying five times a day and fasting during Ramadan – are common among the Muslim publics surveyed. Majorities say religion is very or somewhat important in their personal lives in 17 of the 23 nations where the question was asked. In 14 countries, more than three-quarters of those surveyed say religion is important, and in eight countries it is more than 90%. 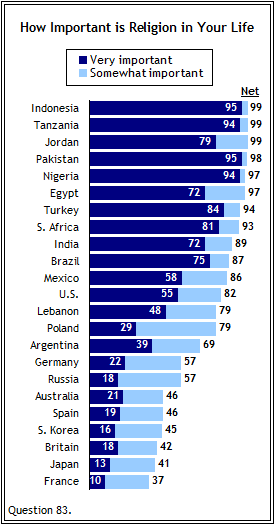 Moreover, in 12 nations, majorities say religion is very important. In Indonesia, Tanzania, Pakistan and Nigeria, more than nine-in-ten say it is very important. Consistently, Muslim respondents say religion is central to their lives. Even in Turkey, a Muslim nation with a strong tradition of secularism, 94% say it is important. In the Arab nations of Jordan (99% important) and Egypt (97%), the numbers are even more overwhelming. Overall, Lebanese are slightly less likely to hold this view, although it is more common among the country’s Sunni (98%) and Shia (82%) Muslims than among Lebanese Christians (67%). Nearly all Indonesians (99%) and Pakistanis (98%) surveyed consider religion important. Elsewhere in the Asia and Pacific region, about nine-in-ten (89%) in predominantly Hindu India rate religion important. The picture is quite different, however, in the more economically advanced nations of Japan (41% important), South Korea (45%) and Australia (46%). More than eight-in-ten consider religion important in the African and Latin American countries surveyed, with the exception of Argentina, where a sizeable minority (30%) says religion is not significant in their lives. Religion is generally less central to the lives of Europeans. Poland is the only European country in which more than six-in-ten consider religion important. And in three nations – France, Britain, and Spain – majorities say religion is not important in their lives. On this measure, the United States differs considerably from Western Europe and other economically advanced nations. About eight-in-ten Americans (82%) say religion is important, and most (55%) consider it very important. The extent to which the United States differs from other wealthy nations in Europe and elsewhere can be demonstrated by examining the relationship between a country’s wealth and people’s views about the importance of religion.4 Generally, religion plays a much less central role in the lives of individuals in high income countries. 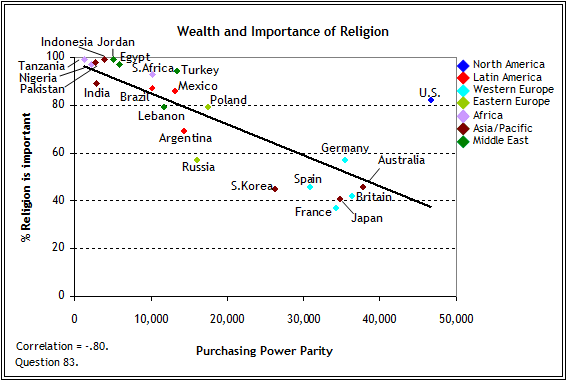 This can be seen in the relative unimportance of religion in Western Europe, as well as in Australia and Japan, all of which cluster near the bottom right of the chart on the following page, indicating high levels of wealth and low ratings for the importance of religion. In contrast, nearly all respondents consider religion important in the survey’s poorest countries, such as Tanzania, Nigeria, Pakistan, Indonesia, and Jordan, which tend to cluster near the upper left of the chart. Meanwhile, in “middle income” nations such as Poland, Argentina, and Russia, religion is neither as central to the lives of people as in poorer countries, nor as unimportant as in much of Western Europe. Across the 23 countries where this question was asked, there is a strong negative correlation (-.80) between the percentage of people saying religion is important and a country’s wealth, measured in terms of purchasing power parity. The clear exception to this pattern is the United States, which is a much more religious country than its degree of prosperity would suggest. Despite its wealth, the United States is in the middle of the global pack when it comes to the importance of religion. Indeed, on this question, the U.S. is closer to considerably less developed nations such as India, Brazil and Lebanon than to other western nations. In most countries surveyed, younger people are less likely to say religion is central to their lives. In countries from nearly every region, persons under age 40 are generally less likely to consider religion very important to them. This is true in the United States, where just under half of 18-39 year-olds (48%) say religion is very important, compared with majorities of those age 40-59 (55%) and those ages 60 and older (64%). There are age gaps regarding the importance of religion in several European countries as well, especially Poland, which is overwhelmingly Roman Catholic. While 49% of Poles ages 60 and older say religion is very important, considerably fewer 40-59 year-olds (29%) and 18-39 year-olds (20%) express this view. Young people are also less religious in another traditionally Catholic European nation: Spain. Just 9% of Spaniards under age 40 consider religion very important, compared with 21% of those ages 40 to 59 and 30% of those 60 and older. Large age gaps also exist outside of Europe and the U.S. In Latin America, a solid majority (57%) of Argentines older than 60 describe religion as a very important part of their lives, but only 43% of 40-59 year-olds and 27% of those younger than 40 do so. More than three-in-four (77%) older Mexicans say religion is very important, compared with 61% of those in the middle age category and about half (52%) of younger Mexicans. Age differences over religion’s importance do not exist everywhere, however. In Indonesia and Pakistan, at least 95% of people both under 40 and over 40 agree that religion is very important. The three African nations on the survey also stand out for their lack of an age gap. For instance, roughly eight-in-ten South Africans rate religion as very important in all three age groups. Women are consistently more likely than men to rate religion as very important in their lives. The gender gap is especially pronounced in the United States. Nearly two-thirds (65%) of American women consider religion very important, a view shared by only 44% of men. Women are significantly more likely than men to consider religion very significant in all three Latin American countries on the poll: Argentina (a 16 percentage point gap), Mexico (16 points) and Brazil (11 points). Double-digit gaps over religion’s importance exist in several other countries as well: Poland (12 points), South Africa (12 points), Spain (11 points), Russia (10 points) and Lebanon (10 points). The gender gap over religion’s importance is smaller or even non-existent in some of the poorest nations in the survey: India, Pakistan, Egypt, Jordan, Nigeria, Indonesia and Tanzania. In addition to generally considering religion more important, Americans also say they pray more often than do others in the West. A majority of Americans (54%) report praying at least once a day, while one-in-three say they do so several times per day. Only 11% of Americans say they never pray. Prayer is much less common in Europe. Even in Poland, only 32% say they pray at least once each day. Among the publics included in the survey, the French are the least likely to pray – only 10% say they pray once a day or more, and fully 60% never pray. 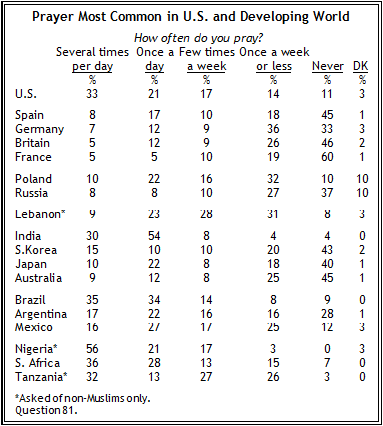 At least four-in-ten also report never praying in Britain and Spain, as well as in Australia, South Korea, and Japan. By contrast, more people in developing countries say they pray frequently. In Nigeria, for example 56% of non-Muslims pray several times a day and another 21% report doing so once a day. Overall, prayer is more common among the Muslim publics surveyed than among non-Muslim publics. The ritual prayer, or “salat,” is one of the five major pillars of Islam, and in five of the eight countries with sizable Muslim populations, most Muslims say they pray five times a day. While a solid majority of non-Muslims in Nigeria pray several times a day, praying is much more common among Nigerian Muslims. Fully nine-in-ten (90%) Nigerian Muslims pray five times each day. Large majorities of Muslims also follow this practice in Indonesia (80%) and Jordan (71%). Fewer than half of Muslims in Pakistan (46%), Lebanon (45%), and Turkey (34%) pray five times per day. In Lebanon, this practice is more common among Sunnis (63%) than among Shia Muslims (35%). The percentage of Muslims who practice another of Islam’s five pillars, fasting during Ramadan, varies considerably across nations. Once more, Nigeria exhibits the highest level of religiosity – 73% of Nigerian Muslims fast during all days of Ramadan and other religious holidays. Tanzania is the only other country in which most Muslims fast during all days of Ramadan. 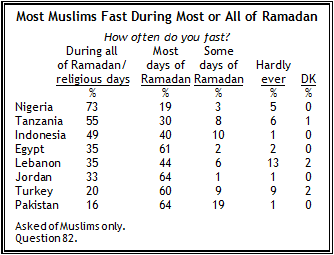 Fasting is least common in Turkey (only 20% fast all days) and Pakistan (16%). However, large majorities in all Muslim publics, including Turkey, report fasting at least most days during Ramadan. And very few Muslims report “hardly ever” fasting – at just 13%, Lebanese Muslims are the most likely to say they hardly ever fast.